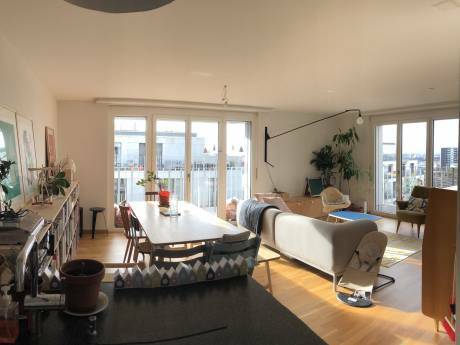 My flat is centrally located (8 minutes walk to the main station), it's in a very quiet corner of Lausanne, and pretty spacious for the area's standards. It is composed by a romantic kitchen (with new accessories: oven, heaters and fridge) that give on a small balcony. A small corridor. One "boudoir" where you can sit and enjoy sunlight during both summer and winter, a big bedroom (with a king size bed, + there are two 80x200 cm mattresses, if you'd be up to 4 ppl for a short stay), and a large living room (with TV, DVD reader, a small and decent design/art books library), high table for 4/6, and a sofa (which is a sofa bed). A terrace overfaces the common garden, where there's a BBQ facility that we share amongst neighbours (we know each other quite well and use to improvise common drinks or dinners). Bathroom and toilets are (as usual in this area) separate. There are lots of windows (N, S and E) so it's very bright all day long. I like "clean" so cleaning will come before and after your stay, it's quite an old flat (partially renovated): I do my best to take good care of it, so of course I expect you to do so, and I'll respect your property as well. Downstairs I have a bicycle with a basket that I use to go shopping. I'm a Events professional in an international company, 33 yo. I love arts and design, theater and music (you'll find many CD's and a small but decent library) and I travel a lot because of my job. Therefore the flat is often available also for non simultaneous exchange. I belong to the couchsurfing network as well. I have to be honest: with all this business traveling I'm quite done with hotels all over Europe, so I'd love to sometimes be able to be in a place that feels like home. Additionally I come from the southern part (Italian-speaking) of Switzerland so this could be considered as a 2nd residence, but still it's a pity that it's empty most of the year. This is also a reason why you won't find any plants to water, nor animals to feed. 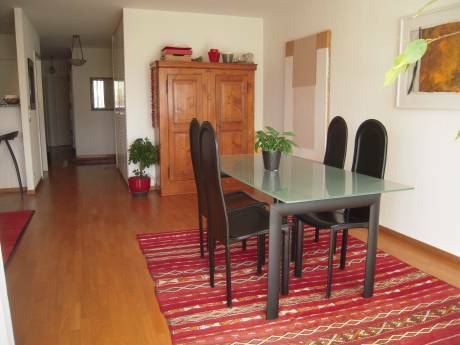 I might be able to arrange a stay in my hometown Locarno (2 rooms flat). I usually travel with one of my friends or my boyfriend: we are finally started renovating our house in Fes, so we'd like to find a place to "feel like home" and get inspired, and we'll be able to home-exchange there as well soon! It's a very quiet and residential area. Lausanne's main train station is at 8 minutes walk, bus station to downtown (which is actually uphills*!) is 3 minutes away. Lausanne is proud to finally have 2 metro lines, they are very efficient and 2 stations are reachable within 5 minutes. The museum of Photography and the Olympic museum, as well as the swimming pool (transformed in ice arena in the winter) are at 5 minutes walk distance. So are nice restaurants and shops. The lake-shore is 10 minutes downhills*. *For those who know Lausanne they will understand: it's San Francisco style: all roads ups and downs!!! 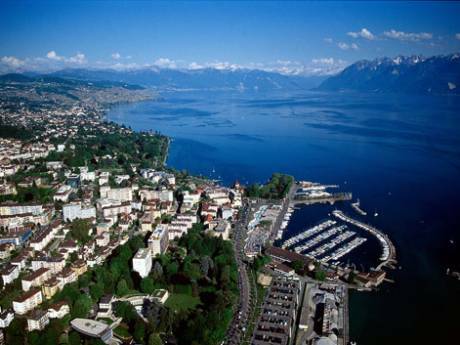 Lausanne is close to the UNESCO patrimony "Lavaux Vineyards" and on the Lac Léman shore. It hosts very good museums and a very famopus art/design school (which gives this vibe to the city). 2 famous hotels are 5 minutes distance: one of the two has a gorgous SPA open until 22:00-perfect to go for a massage&sauna during fall and winter. It's a 4 season destination: summer you can bath in the lake, and in the winter it takes 1 hour to the closest ski facility (by public transport, even less if you rent a car!). This area is very famous for its ski resorts in the alps! Another positive point is that in CH you can go everywhere by reliable public transports: it became my philosophy! Autumn is sweet and springtime colourful.